Susie I love these flowers together…an interesting rich hued vase with the deep red and lilac colors…tied beautifully together with the brunnera leaves. Isn’t it fun when a vase just comes together. Glad you like this combination Donna–I like the colors together too. The vase did come together easily, which is good because I was short on time, but I see some changes I’d make if there had been more analysis up front. What a lovely coloured ‘mum’, I thought it was a Dahlia when I first say it. Do you find the Perovskia tends to shed its flowers rather quickly once cut? A definite autumn feel to your vase this week, Susie. I’m fond of the mum Christina. Although this year I bought a couple of yellow ones to insert among my shrubs in the front yard for a bit of fall color, I usually prefer the darker, wine colored ones. Perovskia doesn’t last well for me either. I’d forgotten that point when I cut a few stems this morning. Thanks Cathy. 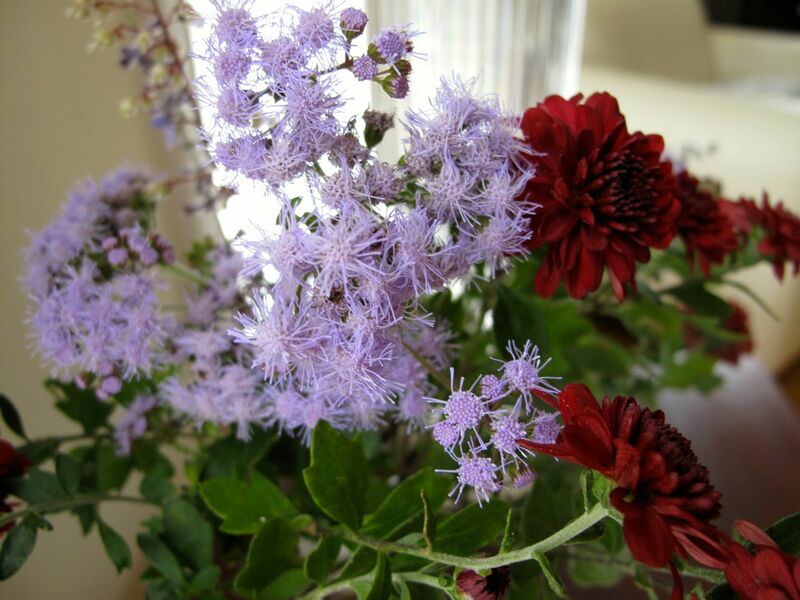 There is an annual called Ageratum that looks like this blue mist flower. Until today I’d thought they were the same. My brunnera is new this year and I’m happy it survived. That’s an interesting brunnera leaf – not as silvery as the Jack Frost I have. It softens the green and pulls the other colours together, doesn’t it? This chrysanthemum is a pretty little flower, and although you imply that the vase more or less made itself it looks perfectly balanced and fluid it shows you have a natural touch – it looks so effective and as always we can learn from your skills. Thanks for sharing! Cathy, that Brunnera is called ‘Silver Heart’ and the outer leaves are nice and silvery. I reached inside for some newer leaves because the others looked a bit worse for the wear. I’ll have to pay attention to see when the foliage takes on a more silvered hue. Thanks for your nice comments. That deep red is amazing. Ann, I think we share an appreciation of fine reds. Thanks Ronnie. I liked the way the colors worked together. Red is one of my favorites. 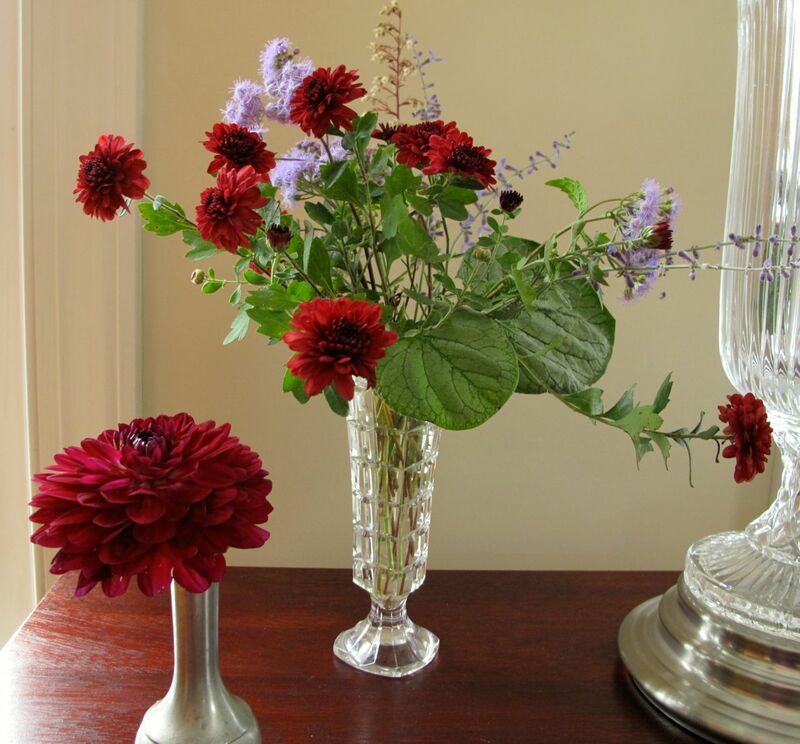 Hi Susie, this is such a beautiful arrangement … if only I had the same talent for arranging flowers … and I do like the striking colour combination. The deep red of the chrysanthemums is stunning – they make a wonderful contrast with the fluffy blue conoclinium coelestinum, another new-to-me plant … I am discovering so many new plants by following Cathy’s meme. Thanks Elizabeth. That blue conoclinium coelestinum was a passalong from my mother’s cousin oh so many years ago. Sometimes I think I’ll dig it all out but then it blooms and I love it again. Thanks Judy. I too like those Brunnera leaves. That plant is new this year and it’s been a nice to brighten up a dark corner of the garden. Thanks Dana. The blue mist flower was a passalong plant I’ve had many years. It’s not particularly attractive most of the year but to have a blue blooming like that in autumn makes me like it more. Such a pretty bouquet! Your dahlia looks to be blooming a lot. I think I have a grand total of two dahlia blossoms at this time. You’ve reminded me to add that Brunnera to my garden. Those leaves are very striking. Thank you! The dahlia has had about 4 blooms so far but it is covered in buds. Seems late to me. Yes, do add Brunnera. Mine is new to my garden this year and I’ve been very pleased. It looked nice all summer. Thanks. This is the first time I remember using blue mist flower indoors and it’s holding up pretty well. Usually I start yanking it up when I see it but invariably some gets left behind and for a few weeks this time of year I gain renewed appreciation for it. Not only the vase is full of poetry but the title as well – beautiful! Thanks for your kind comment Annette. I appreciate that you noticed the title as I played around with it through several iterations. Beautiful. I love the deep red with the blue. I too thought that the Chrysanthemum was a dahlia. I just love that shade of red. Thanks, That Chrysanthemum lives off neglect and barely noticeable in an out-of-the-way place in the garden, but its red flowers always bring a smile when I stumble across them. 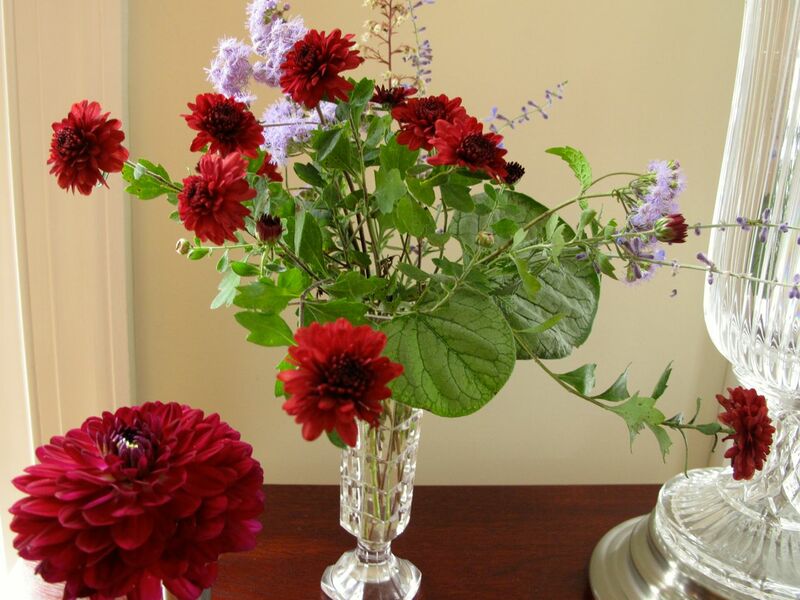 The Ageratum is the perfect element to offset the deep color of the Dahlia, Susie. I’d hoped I’d have Ageratum to use in a vase one day but they’ve performed very poorly for me this year. Sorry about you Ageratum Kris. The leaves looked terrible on mine all summer but it bloomed fine. It held up well in the vase so hope you get some next year.